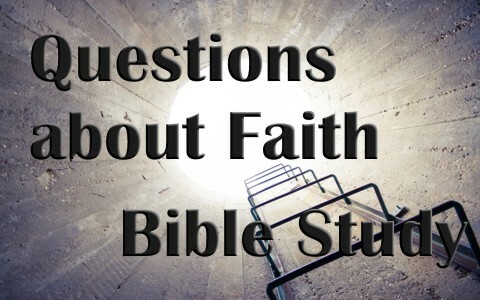 Here are 14 good Bible discussions on the subject of faith. 1. Why is it hard to have faith in God? When a man came up to Jesus to discuss his mute son, he told Him, “I asked your disciples to cast it out, and they were not able” (Mark 9:18b) so “Jesus said to him, “‘If you can’! All things are possible for one who believes.” Immediately the father of the child cried out and said, “I believe; help my unbelief” (Mark 9:23-24). The son’s father said he believed but then says, “Help my unbelief” but why? Can Jesus help our unbelief? It is hard to believe today in God Who we can’t see? 2. Why are we tempted to add to it our own works? We are saved by grace alone and not by works so why is it that we’re so tempted to add works to our salvation? Because it’s just our nature to do so. We don’t like to receive something for nothing. We often want to add baptism, good works, or some other meritorious work to complete our salvation. Yes, we should know that we’re saved by grace alone but grace doesn’t come alone, does it? 3. Does pride interfere with faith? When Elisha asked Naaman, a great commander in the mighty army of Syrian army to dip seven times in the Jordan River so that he could be healed of leprosy, the commander “Naaman was angry and went away, saying, ‘Behold, I thought that he would surely come out to me and stand and call upon the name of the Lord his God, and wave his hand over the place and cure the leper’” (2 Kings 5:11). Did Naaman’s pride interfere with his being healed? Why? 4. What does the Apostle Paul mean by writing “the righteousness of God is revealed from faith for faith” (Rom 1:17a)? Does the Apostle Paul mean a different faith than that of saving faith when he writes Romans 1:17 saying that the righteousness of God is revealed from faith to faith? The faith Paul is talking about is saving faith because that’s the very righteousness of God (2 Cor 5:21) so it is not from works to faith but faith that produces works. Paul may mean the faith of the old covenant led on to the faith of the new covenant, which shows that salvation has been by faith from the call of Abraham to the present time. 5. Paul writes about “the power of God for salvation to everyone who believes” (Rom 1:16) but what is this power? The power of God is found in His Word and in His Spirit, so when the Word of God is heard, it comes with the power of God to make a new creature in Christ (2 Cor 5:17), It is much like Paul wrote in 1st Corinthians 1:18 where he wrote “the word of the cross is folly to those who are perishing, but to us who are being saved it is the power of God” (1 Cor 1:18). 6. Why do they call grace so amazing? The song, “Amazing Grace” gives praise to God for saving wretches like us. None of us are worthy at all, not even one of us (Rom 3:10-12). We were dead men and dead women walking (Eph 2:1) until the Spirit of God enters our hearts and revives us to new life, much like Jesus raised Lazarus from the dead. The fact that we were once enemies of God, being ungodly and wicked sinners shows us that it’s all about God’ s grace and not about us (Rom 5:6-10). It’s not amazing that some are saved…but that anyone is! 7. Are there references to faith in the Old Testament? We might believe that faith is a New Testament belief or doctrine but faith in God has been around as long as the Bible has been written. Noah believed God and it was accounted to him as righteousness, just like Abraham was, as it says in Genesis 15:6 where Abraham “believed the Lord, and he counted it to him as righteousness” (Gen 15:6). Abraham had enough faith that he “considered that God was able even to raise him from the dead, from which, figuratively speaking, he did receive him back” (Heb 11:19). 8. Is believing the same thing as faith? We can believe in something but is that enough? James answers that question by saying “You believe that God is one; you do well. Even the demons believe—and shudder” (James 2:19) so if we say we believe, we can only say “congratulations, you’ve qualified to be a demon” for even they believe but that’s not saving faith or belief so I can believe in highway traffic but if I try to cross the interstate, it won’t save my life. 9. Is having faith enough to save us? It depends on who our faith is in. If we believe in our favorite sports team and believe they’ll win the championship, our belief doesn’t cause them to win it…so faith is not enough unless it is acted upon. Saving faith is revealed over time by how we live so it’s not so much the faith we have but the object of our faith and in Christ, having faith in Him is enough to save us. 10. Why does James write that faith without works is dead? James wrote that faith without works is dead (James 2:17). What he means is that if someone says they have faith but have no works, then that is a dead faith or really, no faith at all. We are not saved by works (Eph 2:8-9) but a genuine faith should produce works, otherwise it’s not really faith. At least the faith that saves. We are saved for works that God has prepared beforehand (Eph 2:10). 11. What does the Apostle Paul mean by writing “The righteous shall live by faith” (Rom 1:17b)? Paul and James are not at odds with each other as some early Bible scholars and teachers believed. God never contradicts Himself. Paul is really saying what James wrote and that’s the righteous shall live by faith and that faith will produce good works. The righteous will live by faith…and the righteous will have evidence of that living by faith (1 John 3). 12. What does the author of Hebrews mean by writing that “faith is the assurance of things hoped for, the conviction of things not seen” (Heb 11:10)? To the author of Hebrews, faith is tangible, concrete evidence of what we hope for in eternity (Rev 22). We have the assurance of God’s Word and not one of His great and precious promises ever have or ever will fail (2 Pet 1:4). Do you have that assurance and conviction of what you hope for, even though you don’t see it now? 13. Why did Jesus say “your faith has made you well? And instantly the woman was made well” (Matt 9:22)? Some people say that if you’re not healed, you didn’t have enough faith and they point out this verse to prove their point, but was Jesus really saying that it was the woman’s faith that healed her? Was it her faith that healed her or was it her faith in Christ that allowed God to heal her? 14. Why did Peter’s faith fail him when he was walking on water (Matt 14:31)? We are sometimes hard on Peter because of his impetuous nature but who else besides Peter ever walked on water? When Peter asked Jesus that he might come to Him, Jesus said, “Come”, “So Peter got out of the boat and walked on the water and came to Jesus. But when he saw the wind, he was afraid, and beginning to sink he cried out, “Lord, save me” (Matt 14:29-30). Why did Peter start to sink (Matt 14:30)? The Apostle Paul wrote that it is “in Christ Jesus neither circumcision nor uncircumcision counts for anything, but only faith working through love” (Gal 5:6) and that faith is for all who trust in Him and it was brought by Jesus Christ’s willingly dying for the sins of all who come to repentance and faith in Christ. Do you believe? What is your faith like? Does it waver like Peter’s on the water?